This is an excerpt from Aggressive Volleyball by Pete Waite. Be in your assigned defensive spot and pause (stop moving) before the hitter contacts the ball. When the ball is attacked, make sure that you are in balance with your weight slightly forward. Being on your heels will cause a slow first step as you move to play the ball or release in transition. If the play is one you can make, play it in a controlled way so that a teammate can set the next ball. Once you make the dig, call out the name of the player who should set the ball (e.g., "Bobbi, set!"). If the attacked ball is out of your area, or if your teammate has a better chance of playing it, immediately sprint for the target area in order to set. Sprint all the way to the net in case it is dug tight; you can always come off the net to get the ball. As you run to set, keep an eye on the direction of the dig in case you have to change your path to get to a ball dug off target. While transitioning to set, call the ball to clear the way if another player is in the area where the ball will come down. If that player is still in the way when you are about to set the ball, physically push him or her out of the way to claim the area. How well the setter defends and transitions determines whether the team stays in system or gets forced out of system. A lazy setter who doesn’t defend or work hard in transition can be the major reason that a team struggles to play at its highest level. It is critical for the setter to play defense all the time, fight hard to get his or her feet to the ball all the time, and cover his or her hitters all the time. The setter is the main cog on the wheel of the team. If he or she does not play aggressively, the team will not operate smoothly. There will be times when the first ball comes to the setter and the team still has to make a seamless transition into the offense. Depending on the difficulty of the dig, the setter’s teammates must quickly analyze the situation and determine who will set the next ball. The next decision to make is which setting technique the nonsetter should use. 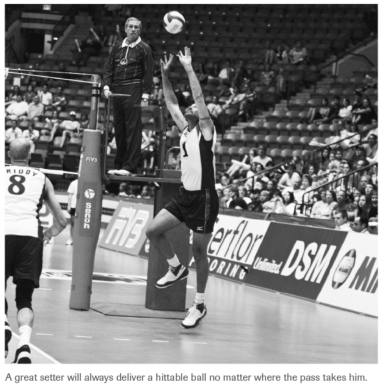 Beginning a few years ago, I asked my nonsetters to bump-set every ball from the backcourt. The reason was this: Too many times over the course of my career, I had watched (and cringed) as my nonsetters used their hands and got called for a mishandle. With rally scoring, that’s one more point we don’t want to give away, and having these players bump-set has worked very well for us. Just make sure that the middles are setting with their hands from the front row in drills and that everyone is learning to bump-set from the back row. Your players will all gain confidence in these skills, and they’ll know how to adjust when the setter digs the ball. In the fall of 2008, the NCAA rules committee agreed to be more lenient in making the double-contact call. The new interpretation explains that if a player is making an "athletic move" to play the ball, he or she should be allowed to double-hit the ball without being called for double contact. As I write this, however, we are 3 weeks into the season, and nonsetters are still being whistled for mishandles. Thus, I will continue to have my nonsetters in the backcourt use their platforms to set the ball when our setter makes the first contact. It may take a season of following how the officials make the calls before I decide to change our strategy. Learn more about Aggressive Volleyball.